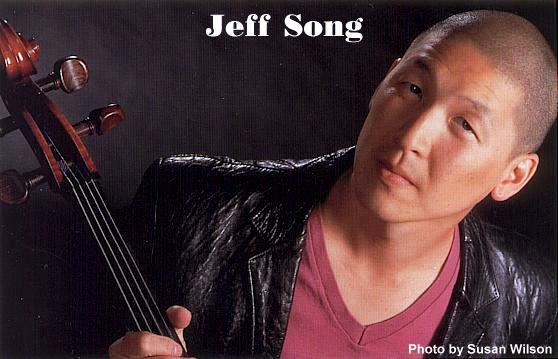 Musician and composer Jeff Song (born 12/22/63) is becoming well known for his contributions to the world of contemporary improvised music and to the growing body of creative music by Asian Americans. Originally from the Midwest, Song has been active in the jazz, folk, rock, funk, new music, and contemporary improvisation scenes in the Boston and New York areas since 1982. Primarily a cellist and bass guitarist, he has also performed and recorded on the kayagum, a Korean 12-string zither. Outside of the traditional Korean aesthetic, Song has developed his own unique style, approach, and technique on this zither as another means for his creative music making. Song received his Bachelor of Arts degree from Boston University (1987), and his Master of Music degree from the New England Conservatory of Music (1992). Inspired by his peers and teachers (Ran Blake and Joe Maneri), Song began to explore improvisation and composition through the music of various non-western cultures (especially various Korea folk genres), and the works of daring 20th century classical and jazz innovators such as Ornette Coleman, Arnold Schoenberg, Charles Mingus, George Crumb, Henry Threadgill, Charles Ives, John Zorn, and John Coltrane. A New England Foundation for the Arts grant recipient (1993), Song continues to develop a musical language that is not readily labeled or defined. The challenge that this music presents -- to both the artist as well as the listener -- is to move beyond mainstream musical conventions and discover meaning through new sonic possibilities. Through his improvisations and compositions, Song strives to expand the range of musical expression, allowing new sounds and compositional techniques to create a richer aural spectrum. Song has performed solo, with his own groups, and with various artists including Matt Turner, Bob Moses, Miya Masaoka, Cuong Vu, Leni Stern, George E. Lewis, Jason Kao Hwang, Michael Zerang, Francis Wong, Tatsu Aoki, Kevin So, Joe Daley, Salim Washington, Phillip Johnston, Drazy Hoops, Two Tru, Glenn Horiuchi, Dean Laabs, Steve Norton, Anthony Brown, Debris, Mark Izu, Phil Gelb, Phantom Arts Ensemble, and Kitty Brazelton¢s Dadadah. He has performed at various festivals including the San Francisco Asian American Jazz Festival (1995), the Chicago Asian American Jazz Festival (1996, 1999), the Knitting Factory¢s What is Jazz? Festival (1996), the Texaco New York Jazz Festival (1997), the Boston Autumn Uprising Festival (1998), the CSPS New Music Festival (1999), and the Boston Asian American Creative Music Festival (1997, 1998) of which he is the founder and artistic director. Song¢s recorded music has been featured on national television, and in an exhibit at the Children¢s Museum of Manhattan. In addition to performing, Song is a teacher and has been a contributing writer to Bass Frontiers magazine. Song¢s plans for the future include new CD releases from Lowbrow, and Two Tru, as well as national and international concert performances.